DROMORE Free Presbyterian Church is holding a special week of ministry meetings beginning this coming Sunday, March 7, at 7pm. The meetings will continue, Monday to Friday, March 8-12, at the later time of 8pm. The emphasis each night will be upon the Word of God and the theme for the week is 'Truths for Today from Titus', the series including subjects such as The Hope of Eternal Life, The Threefold Focus of a Godly Life and The Gospel That Shook the World. "We believe the preaching of God's Word is essential for the strengthening of God's people and the only real answer to man's need," said Dromore Free Presbyterian Minister, the Rev. Ian Kenny. Belfast native Dr. Alan Cairns will the guest speaker each evening. Dr. Cairns ministered for 30 years in Greenville, South Carolina in the United States of America; he has now retired and returned to Northern Ireland, living at present in Ballymoney. A well-established and highly respected theologian, whose labours included lecturing in theology and forming what is now known as the Geneva Reformed Theological Seminary in the US, Dr. Cairns also founded the international radio ministry of the Free Presbyterian Church 'Let the Bible Speak'. In addition, he wrote several books, including a Theological Dictionary and an exposition of The Lord's Prayer. The congregation in Dromore is looking forward to Dr. Cairns' visit and, said Mr. Kenny, it is hoped that many will gather to hear the Word of God being preached. The first ever trace of a Free Presbyterian witness in Dromore was a Gospel Meeting conducted by Dr John Douglas who was then the minister of Moneyslane Free Presbyterian Church. This tent Mission, which lasted five weeks, took place in a field on the Barronstown Road in the early 1970's. Some years later, in the month of May 1975, an outreach work commenced in the town under the auspices of Banbridge Free Presbyterian Church. This was the result of a very successful Gospel Mission conducted by Rev Fred Buick, who ministered in Banbridge at that time. On Sunday 6 July 1975 the Dromore witness was founded when meetings commenced in the British Legion Hall in Princes Street, home for the next four years and three months. This hall was to become the home of the Free Presbyterian Church in Dromore for some 14 years and four months. In June 1980 a local man, Mr. David Priestley, was placed in charge of the work as a student minister. He later became the first ordained minister of the congregation. Many missions were held in the years that followed as the Rev. Priestley worked in evangelising the area. As a result the church was well established in the town. On Sunday 19 September 1982, Mr Aubrey Malcolmson, Mr Robert Skelton and Mr Irvine Dawson were ordained as the first elders. In March 1991, after 11 years of faithful service, the Rev. Priestley felt the call of God to take up the work in Clogher Valley Free Presbyterian Church. That same year saw agreement reached with a landowner for the purchase of a one-acre site at Quillyburn. Although the area was zoned for industrial development permission was finally granted to build a church. On Saturday 2 October 1993 a stone-laying ceremony was conducted with the Rev. Dr. Ian Paisley as preacher. In December 1993, just prior to the opening, the Rev. Fred Buick, who had been instrumental in starting the work, was installed as minister. The present church was opened on Saturday, 29 January 1994. The Rev. Buick remained in the church for a year and three months before returning to Australia in MArch 1995. 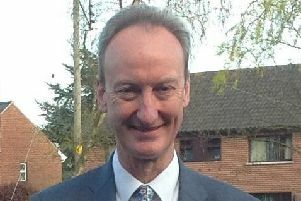 The present minister, the Rev Ian Kenny, was installed in November 1996. Under his ministry there has been a steady growth in the work with many new families joining the church. The Kirk Session currently consists of four office-bearers, namely Mr. Frank Blakely, Mr. Gilbert English, Mr. Paul Haffey and Mr. Aubrey Malcomson. Mr Robert Skelton, who was a founder member of the church and also served on the Session, passed away in August 2008. The present committee consists of five members, namely Mr. Isaac Banks, Mr. John Brown, Mr. Campbell Gibson, Mr. Sam Gardiner and Mr. David Scott. FUNDAMENTAL in doctrine, the Free Presbyterian Church believes in the divine authority and verbal inspiration of the Bible, and the great fundamental doctrines of grace it contains. The Scriptures alone are the supreme authority in matters of faith and practice. The Free Presbyterian Church uses only the Authorized Version (KJV) of the Bible.